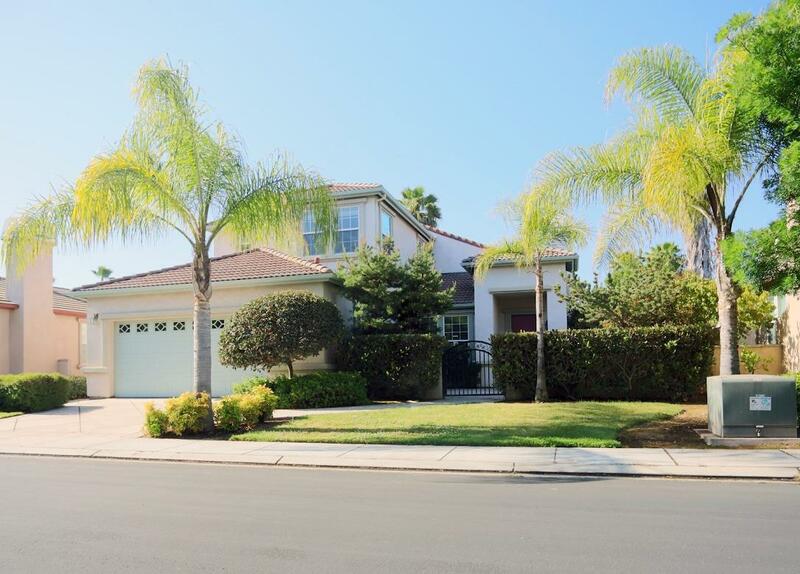 This lightly used home in the desirable lots in the gated community of The Villas. Southern exposure overlooking the golf course and water feature. Kitchen has been upgraded with custom paneling cabinets including matching custom panels to refrigerator & granite counter tops. 18x18 tile floors throughout the house with the exception to the bedrooms. 2 Master Bedrooms. One downstairs and 2nd upstairs. Downstairs master bedroom has a sliding door leading to backyard with golf course and pond views, and cover patio. Two sky lights, one in upstairs master bedroom and one in loft area, providing lots of natural light. Third bedroom with full bath, and a downstairs powder room for guests. Loft suitable for an office, play Custom Hunter Douglas window coverings. Ceiling fans throughout. This house is wired for surround sound inside and out. A gate opens from the back yard to the cart path, and the home is within easy walking distance of the clubhouse and pro shop. Community pool/gym.